Yes, the person I hired came through CareerCross. The perfect candidate for us! Thanks for the support! We were able to hire personnel who possess excellent skills and are capable of speaking multiple languages. As a company looking to enhance our global expansion, we were able to conduct a successful recruitment campaign. We have been very pleased with CareerCross over the last couple years. We have been able to get some great people connected to AINEO Networks and into our team. We look forward to more great people through their service for years to come. "We have been using CareerCross for about a year now, and are filling many vacancies through the site. We are hiring mainly in IT and logistics, and we have found that CareerCross has many strong candidates in these fields." 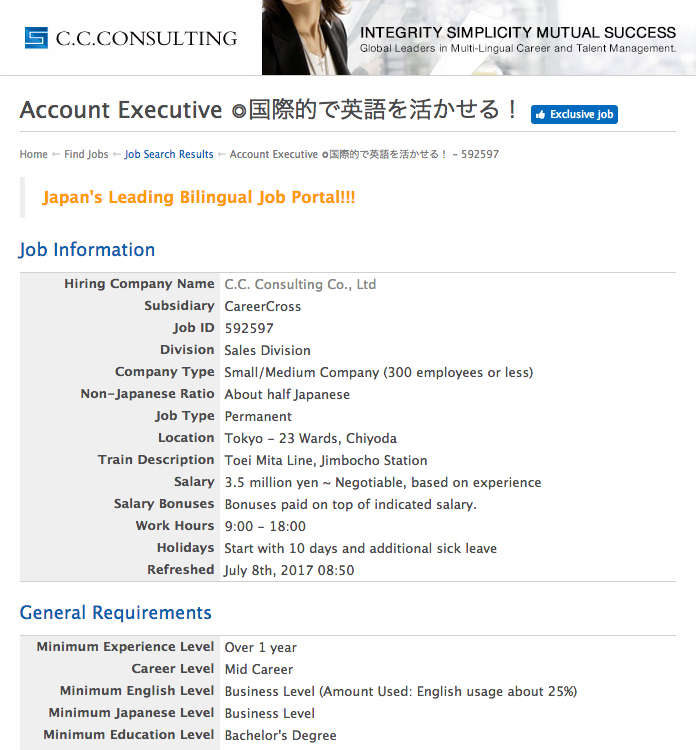 "If you’re looking for bilingual professionals, there’s no better site in Japan than CareerCross." "We are happy with the high recognition CareerCross has with professional bilingual candidates, the allround support, and the user-friendliness of the site. We can fully recommend CareerCross anyone looking for recruiting support." I think CareerCross has many candidates, especially bilingual professionals. We could use scout mails to attract them and it is easy to manage applications and candidates. We hired 2 people using CareerCross and it is very cost-effective! We will ask for their help again for future hiring. Our company had used some other major job boards before but it was difficult to find global talent who matched our needs. As soon as we started to use CareerCross, it was a pleasant surprise, we received a lot of applications from the type of candidates we are looking for! There are many internationally minded candidates registered and the service fee is reasonable. One more thing we found, which was very attractive, we could also search and contact registrations who were living overseas. We were able to hire excellent candidates with proficient English in a short period of time. I really appreciated this service and hoping to work together again soon. CareerCross is very famous in the industry, a database with a weath of talent. With help from their professionals, we were able to find excellent candidates in a short time. "We always use CareerCross for hiring. There are many job seekers in CareerCross’s database. Most of them speak fluent English and willing to learn/improve. Also, the database is easy to use for both companies and candidates. The response ratio for scout mails are much higher than all the other job boards. As a result, we could hire candidates. In addition to this, we also appreciate assistance from CareerCross’s professionals. Especially when we are busy and need help or advice creating job advertisement, this really helps us a lot. We will continue to use CareerCross for hiring in the future." "I successfully used Careercross at my previous employer. In my opinion, Careercross works very well when looking for bilingual candidates. As LNS Japan is part of an multinational group, bilingual language skills and an international background is very important for some positions. Therefore we decided to try Careercross. I was positively surprised that we managed to find people not only for our Tokyo office, but also for Nagoya and Ishikawa-ken."